With a new barrage of Lexus ads hitting the market, this trusted vehicle has developed a newfound following. Lexus has impressed owners for generations with their outstanding array of safety features, their sturdy design, and their superior engines. Is the hype surrounding Lexus simply the result of good advertising or is the Lexus worthy of such accolades? You decide. Lexus is unparalleled when it comes to quality design. Given the rigorous standards maintained by the designers, it’s no surprise. Lexus runs their assembly process with military-like precision and expects nothing less than the best from each and every component that enters the Lexus ES. When building the Lexus ES, Lexus technicians are trained to know the front, back, top, and bottom of every part that goes into an engine. Using their hands, individuals examine every component. They look for otherwise unnoticeable flaws in the parts, so that they can be fixed before they complete the assembly of the engine. In addition to this treatment, Lexus ensures that no dirt or particulates (including dust) have any contact with the parts via a clean room. In this room, technicians are subjected to a specialized shower of dry air to blow away any dust particles than may have attached themselves. Each part is kept in specialized containers and vigorously vacuumed more than once before it proceeds to the next step. In addition, employees are required to wear anti-static clothing. They have also added screens covered with water that catch dust in the air. One aspect of the unmatched design practice is that each and every engine is individually fired and inspected before it goes into a new Lexus. When the engine is inspected, it is not a computer or a robot doing the work; there is a human being examining every aspect of the engine. Called their “stethoscope treatment”, the inspector uses a stethoscope in order to ensure the engine sounds perfect. Often the people conducting these tests are said to have an extra special ability to hear sounds that typical human beings cannot. Why are technicians so disciplined in their approach to assembly? They must submit to periodic skills tests, such as routine assembly of hoses. During this test, they must call out each step as they complete it. The process has been compared to a drill instructor, recruit relationship. With this intense training, however, experts are made. The sense of touch is so important in the Lexus assembly process, that each technician is required to run their hands over perfect components. This process is repeated every two hours to ensure that their skill remains fresh. It is because of this testing that Lexus technicians are able to feel things that others cannot, including slight inadequacies. When it comes to the materials required to assemble a Lexus vehicle, there is a person that has been employed solely to inspect each portion of aluminum that goes into the construction of the engine. This individual watches the formation of the aluminum from liquid to solid, ensuring there are less gasses than in other aluminum. Before a Lexus leaves the assembly plant, it will be subjected to a barrage of extreme environments. Each and every car must go through rigorous testing with EMI and radical temperature changes. This testing helps to guarantee that the electronic components of the car will function under every circumstance. Cleanliness is also of the utmost importance in the completion of a Lexus ES, to ensure a flawless paint job. Each ES is given two different base coats that allow for a different appearance depending on sun and clouds. Each of these base coats allow for maximum glint with no mind paid to the weather. Even seemingly mundane tasks, such as the stitching of leather is done by a human being. That person also has to undergo a very specific test before being certified to hand-stitch the leather on a Lexus vehicle. In order to gain the certification, the prospective employee must be able to fold an origami cat in 90 seconds with one hand. The crux of this test, however, is that they are not allowed to use their dominant hand. Only a handful of people have been certified for this job, thus far. Lexus has also been named one of the most reliable cars on the market, with scores measuring in the above average range. In Consumer Reports’ reliability surveys, many aspects of the car are tested for trustworthiness, even down to the sound system controls, and Bluetooth features. 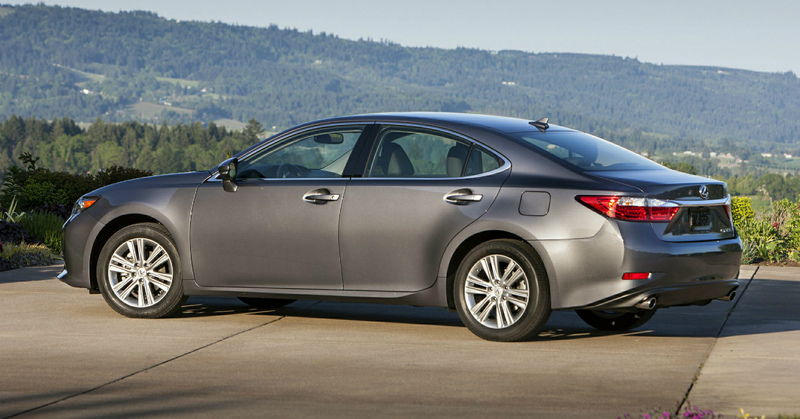 Every model in Lexus’s line scored above the average in testing. It is with these vigorous standards and assembly techniques that each Lexus ES takes five hours to complete. During these five hours, the ES in constructed to be a reliable, streamlined, and precise automobile. Given the standards on this particular model, it is no wonder that Lexus has earned such a solid reputation in the industry for being a quality vehicle.